Hey guys! 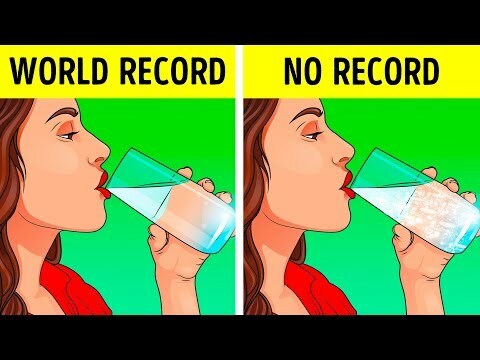 What about breaking a record? You probably think that Guinness World Records are something only a chosen few can do. But what if I told you that there are records you can break at literally any moment without leaving your home? On top of that, some of them don't need any specialized training! For example, in 2010, the citizens and students of Ordos City, China, created the longest human domino line. It was 4.47 miles long and consisted of 10,267 people. It's hard to believe, but the participants spent 69 minutes and 43 seconds completing this unusual domino line! Are you ready to challenge yourself and do something like that? - It seems that a cup percussion ensemble is a pretty fantastic thing. Such a performance in Xi'an, China, earned a Guinness World Record on May 21, 2017. 2,398 people gathered together and performed the song "Pursuing." - Have you ever entertained yourself by blowing peas? Then you have a chance of breaking the record of Coby Cotton from the US. He managed to blow a pea 26.24 ft. This amazing event took place on February 13, 2018. - Silvio Sabba from Italy set a curious (and probably pretty painful!) world record on December 27, 2012. On this day, he clipped 51 clothes pegs to his face. It took him just one minute. - Silvana Shamuon from Waterloo, Canada, became a famous record holder after she kicked 59 items off people's heads in one minute in 2016. Since then, nobody has been able to break her record. - If you know how to keep your balance and you're on friendly terms with tennis balls, you can try to break another record of Silvio Sabba, the guy I've already mentioned. The Italian managed to hold a whopping 26 tennis balls in just one hand! - The employees of the company made the longest line of sticky notes. In one line, there were 114,741 pieces collected from all over India. The length of the line was 5.18 miles! - If you have a lot of space at hand and some moonwalking skills, you have everything you need to beat the next world record. The longest distance a person moonwalked in an hour is 3.54 miles. - Ross McCurdy from the US cracked 32 eggs with one hand. So far, this has been the largest number of eggs cracked within one minute. - Do you want your windows to be always clean? Then start training to break the world record for the quickest window cleaning! The current record is pretty impressive: 3 office windows in just 9.14 seconds! Nobody has been able to achieve better results since 2009. - The fastest time recorded for a person drinking 16.9 oz of water was 1.75 seconds. It happened in London during the XFM Breakfast Show in 2014. - Just how much time do you spend in the shower? The less, the better — at least if you want to break the world record for the shortest shower ever taken. The current record is 33.18 seconds. Is that coby cotton from dude perfect? ?